I arrived in Chapel Hill in late Aug. 1950. Straight out of 5 years at Valley Forge Military Academy. I knew absolutely no one in Chapel Hill or with UNC. I was put in an orientation group headed by Taylor "Buddy" Vaden. Buddy was a Phi and got me an invitation to rush at Phi Delta Theta. I received a grand total of four rush invites. I was asked to join PDT and my new life began. As we all have, I met guys that became life long friends. Friends that were part of my life from my first year at UNC. Fred Mallard, Art Friemuth [ my big brothers, both deceased], Pat Pattison [deceased we were in one another's weddings] Sherwood Smith [counselor] Greg Poole, Buddy Heins [deceased, we sailed, traveled and did Scuba diving together] Leroy Townsend [deceased], Bob Page [but for Bob we might not have survived] Matthew Mason[deceased. Who kept us all getting to 8:00 classes], Ty Boyd [my roommate for two years], George Blackwelder [deceased,who once saved me from harm], Bob Collier [Rock],Dave Finch [deceased. Who snaked my date and married her], Dave Nichols [owner of the College Shop where I worked for spending money], Press Millen [who typed minutes for me when I was fraternity secretary. I could not type], Van Weatherspoon, John Boushall [deceased], Phil Woods [who I visit frequently in Fl.] Tom Kerns [deceased] who was my ophthalmologist, Baxter Sapp who was my dentist. We cannot forget our dear housemothers. Mrs. Tanner and Mrs. Neal. They were truly Saints. NC Beta of Phi Delta Theta has had a profound effect on me with life long friendships. I have hunted, fished, sailed, boated, partied, traveled and had professional and business dealings with many of my "Phi Delt Brothers." 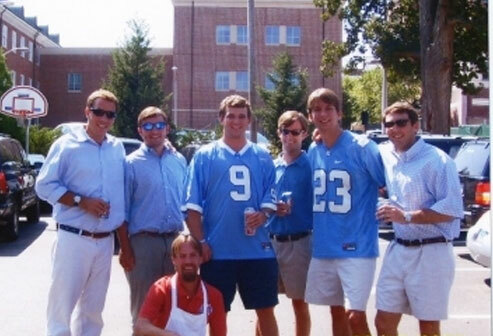 NC Beta is more than a fraternity, It is a "Camaraderie."